Biography of French Mannerist Sculptor Noted for Bronze Statuettes. One of the last French Renaissance sculptors and a follower of the French court sculptor Germain Pilon (c.1525-90), Barthelemy Prieur was a French artist of the Mannerism era who was active during the last three decades of the cinquecento (16th-century). He worked mainly on funerary monuments and portrait busts, but also on the type of small bronze statuettes popularized by Giambologna (1529-1608). His surviving sculpture can be seen in the Ashmolean Museum Oxford, the Wallace Collection, the Louvre, and especially in the National Gallery of Art, Washington DC - the home of his sculptures Gladiator, Lion Devouring a Doe, Seated Woman Pulling a Thorn from Her Heel, and Small Horse. Prieur was born into a French Huguenot family in Berzieux, Champagne in the department of the Marne. But as to how he became acquainted with sculpture or which workshop he trained in, or what early works he created, we don't know. All we know is that during his twenties he travelled to Italy where, between 1564 and 1568, he worked in Turin for the Duke of Savoy - Emmanuel Philibert. Upon his return to France about 1571, Prieur worked under Jean Bullant at the Palais du Louvre, where he was a younger contemporary and pupil of Germain Pilon. He also found himself an aristocratic patron in the person of Anne de Montmorency, who employed him at the Chateau d'Ecouen. In 1571 (or perhaps later in the decade), Prieur executed two religious monuments - based on the drawings of Bullant - which he dedicated to De Montmorency: a tomb at the Montmorency church and a funerary column in the Celestine Church in Paris. For the latter, a monument to the heart of his patron, he was commissioned to sculpt three allegorical life size sculptures (Louvre, Paris) representing Peace, Justice, and Abundance. In 1573, Prieur was employed by Catherine de' Medici on the decoration of the Tuileries Palace. Later, in 1585 he carved and cast the bronze funerary monument to Christophe de Thou, (Louvre, Paris), and in 1591 he was appointed sculptor to the French King Henri IV. 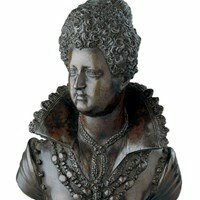 Subsequently, he was noted for his bronze sculpture busts (c.1600) of Henri IV and his wife Marie de' Medici, and his 1602 restoration of the Roman marble statue known as the Diana of Versailles. To learn how to judge plastic artists like the French Mannerist sculptor Barthelemy Prieur, see: How to Appreciate Sculpture. For later works, please see: How to Appreciate Modern Sculpture. He was also noted for his small bronze figurines - a type of sculpture popularized by the great Rome-based Flemish master Giambologna, who created figures with gracefully elongated bodies. In fact the sophisticated Prieur preferred to create his statuettes in a more intimate format, opting to depict different moments of a woman's toilette. An example is Women Bathing (1595-1610, Walters Art Museum, Baltimore, USA). In a variant of this style, Prieur also sculpted a number of tenderly observed genre scenes, as exemplified by Shepherd Boy Removing Thorn (Gallarus Museum New York). Nearly all Prieur's small-scale sculptures are characterized by their fine detail, as in features such as fingernails, toenails, and knuckles. Barthelemy Prieur died in Paris, in 1611, at the ripe old age of 75.